From outside the eastern side of Panteli Castle, all three of its defensive circuits are visible: the Byzantine innermost and middle ones as well as the outermost and latest, created by the Knights of Rhodes. A series of crumbling medieval walls, perched high above a deep blue sea, overlooking a fascinating scenery of coves and bays, a dense jumble of ornate mansions and distant shores in all directions. 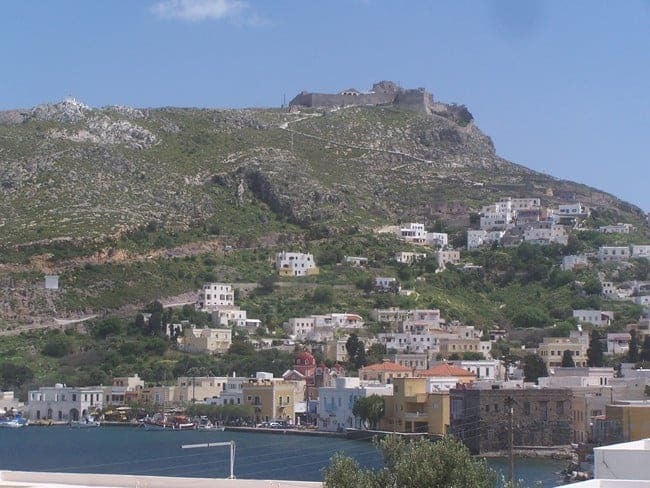 This is the castle of Panteli on the small island of Leros in the Dodecanese, the archipelago of Greek islands that is spread along the southwestern shore of Asia Minor. 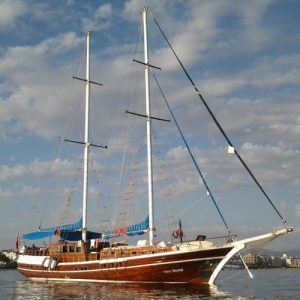 Yesterday, I took my guests on the ongoing Cruising to the Cyclades there – and I am certain they will remember that visit, as do our guests on that tour and on Cruising the Dodecanese every year. 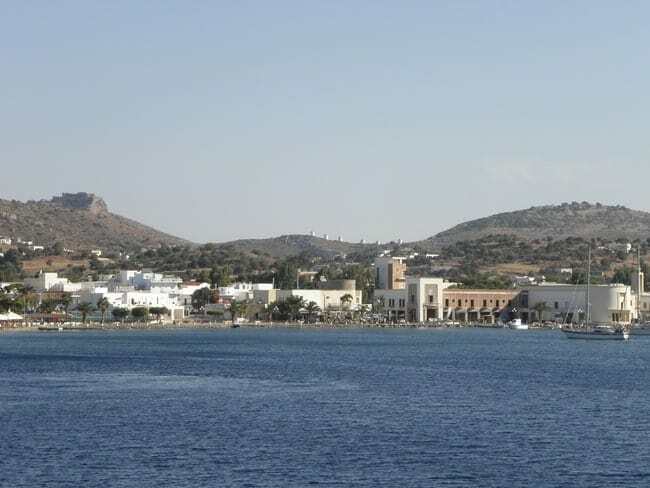 The port town of Agia marina with its fine Neoclassical mansions and the Castle of Panteli far above. Beyond its sheer beauty, the castle offers a window into the history of the island itself. 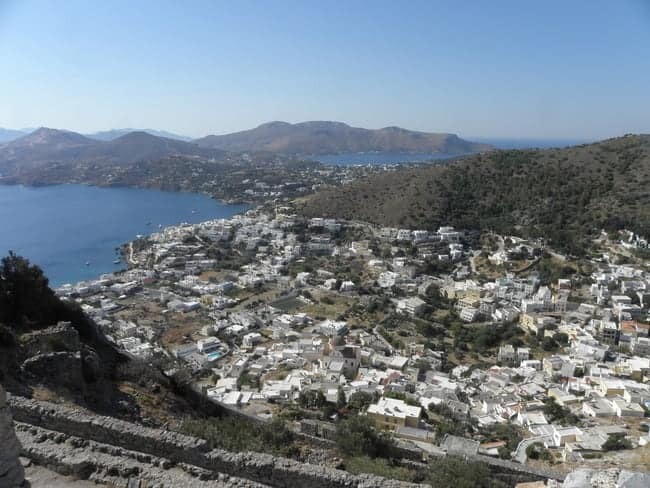 Its location appears to have been pivotal to the fates of Leros more than once, all the way from distant antiquity to the 20th century. 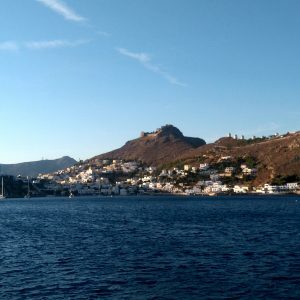 As a result, the castle stands tall over Leros not just physically – it is visible from nearly everywhere on Leros and the waters around – but also in the island’s consciousness, taking a central place in its legend and tradition. To this day, the chapel of the Panagia (the Virgin Mary) within its walls is the target of a great procession every year on the Feast of the Dormition (August 15th). We know little about Leros in antiquity, since systematic excavations have not yet been undertaken, but it seems clear enough that the little island tended to be a dependency of larger powers, for example of nearby Miletus in the mainland of Asia Minor, and at other times (especially in the 5th century BC) first of Athens, later of Sparta. Circumstantial evidence suggests that the castle hill (Pityki) was a focal point already then, most likely serving as the island’s main acropolis, a place of refuge in times of trouble and perhaps also one of sanctity. No wonder: it is a strategic spot, easily defensible in times of trouble and overlooking two good anchorages sheltered from the prevailing westerly winds. In Roman years, the harbour just below was certainly in use. A westward view from the castle, across Panteli village and – in the distance – the gulf of Lakki. The first built fortification we definitely know of was constructed during Byzantine rule, most probably in the 10th or 11th century. In essence, that small castle still survives, now forming the innermost and uppermost defensive circuit of Panteli, encompassing its highest summit with relatively thin and vertical walls. A second line of defences was later constructed around the initial one, enclosing a much larger area, but not displaying much advance in terms of the development of defensive architecture. It, too, is of Byzantine date, as both are mentioned in documents of 1087 and 1088, when Byzantine Emperor Alexios I Komnenos granted both to the newly-founded monastery of St. John on nearby Patmos. After the Fourth Crusade in 1204, Leros, and with it the castle, fell first into Genoese hands, then into Venetian ones. 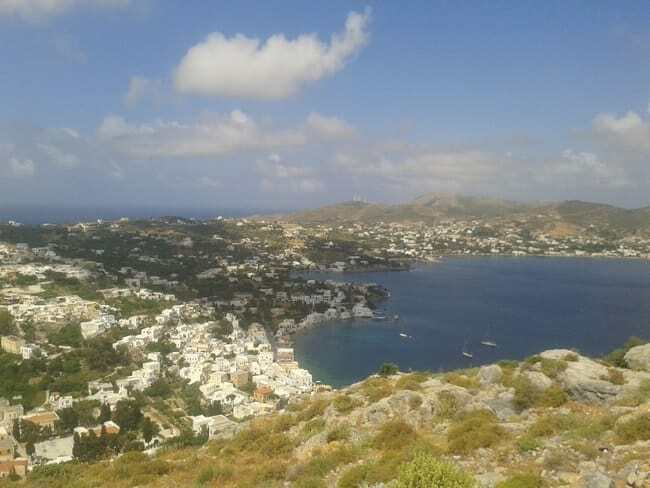 Little is known about what happened on Leros during those turbulent times. Along with the entire Dodecanese chain, the island was ceded to the Knights of Saint John (or Knights of Rhodes) in 1309, and they were to retain control for over two centuries. View alongside the eastern edge of the castle and the windmills on the continuation of its saddle towards the southeast. As a reaction to the growing Ottoman threat in the region, the Knights embarked on a major expansion of the castle during the 15th century, adding a third circuit of walls, now more elaborate and thus more suited to the military developments of the time, and increasing the enclosed area considerably, probably to serve as a refuge for the island’s entire population. Although this outer castle is clearly more modern than its predecessors, it did not adopt the full complexity of the systems of bastions and batteries that began to develop around then and that can be observed in other fortifications by the Knights: the steep and inaccessible hilltop location probably rendered such elaborations both impossible and unnecessary – with the exception of a fine bastion guarding the gate. Two ruined bastions on the northern side of the castle ought to date to the same period of improvement (I thank George Pallas for drawing my attention to them)..
View from the castle across Alinda Bay and the north of the island. 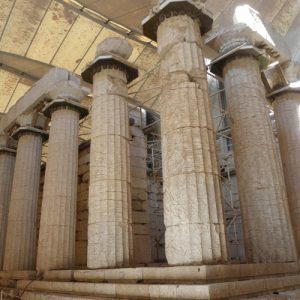 Its construction was to little avail: Leros was surrendered to the Ottomans along with the entire Dodecanese after the final Siege of Rhodes in 1522. While the departure of the Knights ended the architectural development of Panteli Castle, the stronghold continued in use as the seat of an Ottoman garrison. Part of the castle’s good preservation can be ascribed to that continuity of use: the revolutionaries of the 1820s’ Greek War of Independence, having temporarily liberated Leros, will have made some use of the structure, as will the re-established Turks after 1832, and finally the Italians, having occupied the Dodecanese in 1912. During the same years, the affluent neighbourhoods of Panteli, Platanos and Agia Marina grew in its shadow, with their fine mansions built by wealthy Leriot merchants active mostly in Alexandria. Those villages, now the most beautiful in the island, are very much dominated by the great castle towering above them. A series of windmills serving those settlements’ need for flour now shared the ridge with the crumbling fortress. 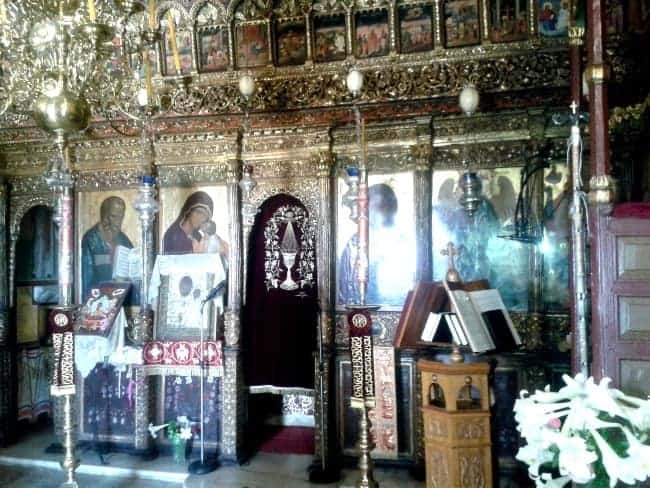 The interior of the Church of the Panagia (Virgin Mary) in the castle. 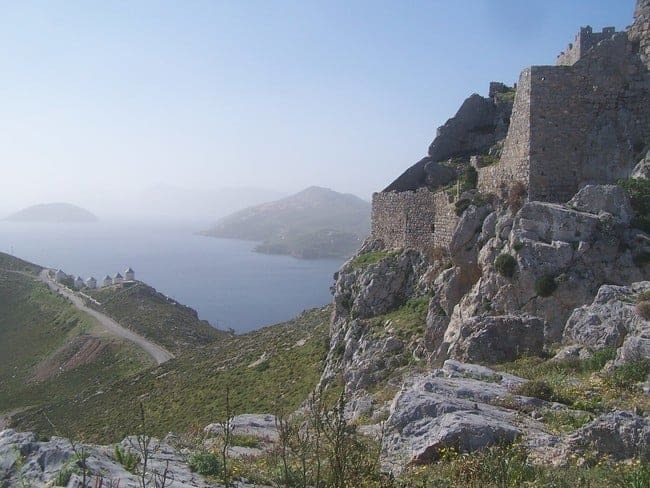 The castle dominates Leros. Here, it is seen overlooking Lakki, the Italian military town constructed in the 1930s on the far (eastern) shore of the island. The last time the castle was used in warfare was during the momentous events of the Battle of Leros in 1943. After Italy’s surrender, British forces had occupied the island to help the Italian troops stationed here in preventing Leros from falling into German hands. After three weeks of a massive bombing campaign, during which parts of the castle were damaged, German paratroopers and amphibious forces assaulted Leros on October 11th, defeating the much more numerous defenders in a matter of days. Some of the invaders actually landed on the barren shore below the castle, which was itself the site of several gun emplacements. 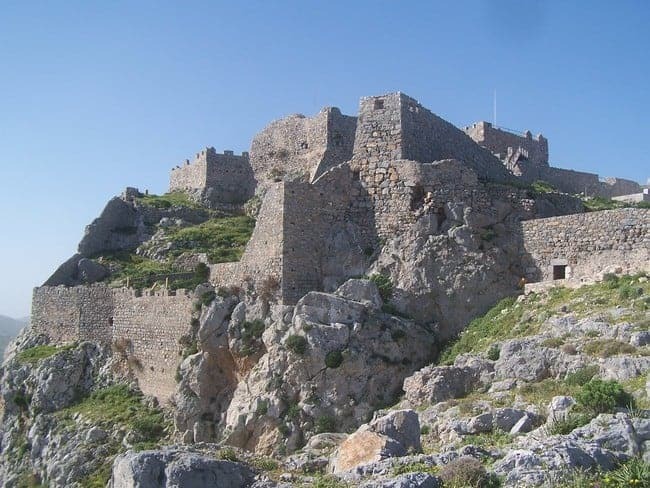 Since those turbulent days and since the accession of the Dodecanese to Greece in 1947, the castle has seen more peaceful times, and recent renovations have stabilised the remains so that they can continue to remain the island’s symbol for centuries to come. You can enjoy the castle of Panteli in all its glory for yourself, by joining us on Cruising to the Cyclades or on Cruising the Dodecanese! Mr. Hall failed to notice the ruins of two bastions on the northern side of castle. Probably destroyed in 1651 by the Venetian, Leonardo Foscolo. Also refer to Coronelli’s map of 1688. Thank you for the correction. 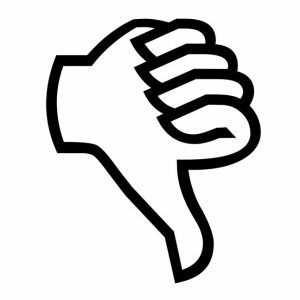 I think you are right and I have included a reference in the post. Our website does not claim academic status, but we like to be accurate and are grateful for your comment.